Larry is a certified instructor through the International Traditional Sun Tai Chi Association (ISTA) He trained and received his certification through Dr.Jacques Moramarco who is a Traditional Sun disciple through Master Sun Shurong (grand daughter of Sun Lutang). Larry has earned a B.A and M.Ed and is a retired school teacher after 36 years in the education profession. 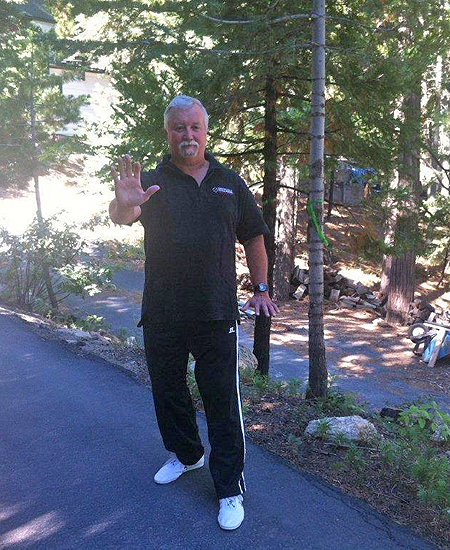 Larry also holds a black belt in Shito-Ryu karate and has over 40 years of experience in Japanese karate. North Cascades Tai Chi is a school that features Traditional Sun and Yang Styles of Taijiquan (Tai Chi). In Sun Style the primary form taught is the Traditional 98 form. Students may learn the Sun 35 short form after completion of the 98 form. The short form we do was created by Master Sun Wan Rong, granddaughter of Sun Lutang (younger sister of Master Sun Shu Rong). The Yang 108 form is the foundation of the Yang Style. The 5 section Yang short form by Sam Masich is used as an introduction to the Yang style. The Cheng Man Ching 37 short form may be taught to students who complete the 108 long form. Sun style tai chi is the youngest of the 5 major styles of Tai Chi. It is known for it's lively stepping with follow steps and "kai he" (open/close) qi qoing throughout the form. It is sometimes referred to as the quick step/open close style. The five major styles of Tai Chi from oldest to youngest are: Chen; Yang; Wu (pronounced like woo); Wu/Hao(pronounced like woo-oo) and Sun. All are part of the Chinese internal martial arts family which also includes but are not limited to; Xing Yi, Xin Yi and Bagua Zhang. The founder of the Sun style, Sun Lutang was a skilled martial artist in the internal kung fu styles of Xing Yi Chuan and Bagua Zhang. These two styles had a strong influence on the development of the Sun style, as well as the Wu/Hao style of Tai Chi that he learned directly from Master Hao. It was in Master Sun Lutang's later years that he developed his style of tai chi. Sun Lutang taught his son, Sun Cunzhou these skills as well as his granddaughter Sun Shurong (Cunzhou's daughter). Master Sun Lutang also taught other students including his well known daughter Sun Jian Yun. The Traditional Sun style that is taught at North Cascades Tai Chi is a direct result of Larry's learning from Dr. Jacques Moramarco who learned the style personally from Master Sun Shurong in China.